"Today, the United States and its allies and partners are facing a China more capable and increasingly confident in its ability to use the military as a tool to intimidate countries throughout the Indo-Pacific and support the expansion of its global interests," says the annual report of the U.S.-China Economic and Security Review Commission. Two decades of modernization of forces by the People's Liberation Army, the Communist Party of China-led army, "has already resulted in a force capable of contesting U.S. operations in the region, presenting challenges to the U.S. military’s longstanding assumption of enjoying ground, air, maritime, and information dominance in a conflict in the post-Cold War era." The 539-page annual report by the bipartisan commission was made public Wednesday and outlines a range of troubling Chinese activities and policies in addition to the military buildup, including large-scale cyber theft of American technology, increased arms sales to rogue states like Iran, and bullying of regional countries in Asia, including Taiwan. The report warns that Chinese supreme leader Xi Jinping "significantly accelerated China’s military modernization goals in late 2017, requiring the People’s Liberation Army (PLA) to become a fully ‘modern' military by 2035 and a ‘world-class' military by mid-century," the report said. The new guidance from Xi directs the PLA to achieve these goals nearly 15 years sooner than previous military modernization goals. Prior to reaching its military buildup goals, China also may resort to covert information and non-kinetic warfare to achieve its objectives. The commission said the military buildup is part of Chinese efforts to take control over Asia and is increasing the danger of war. "Prior to the PLA achieving its objectives of becoming a ‘modern' and ‘world-class' military, Beijing may use coercive tactics below the threshold of military conflict rather than resorting to a highly risky use of military force to achieve its goals in the region," the report said. "However, as military modernization progresses and Beijing’s confidence in the PLA increases, the danger will grow that deterrence will fail and China will use force in support of its claims to regional hegemony." The report warns that the buildup poses new dangers for the United States and its allies in Asia that are seeking to maintain the traditional democratic and free market order in the region against Beijing's communist expansionism. Caroline Bartholomew, a China commission co-chairman, said the rapid buildup includes a streamlined command structure and improved Chinese military ability to contest U.S. military operations. The commission has asked the U.S. intelligence community to produce a report on how China's Belt and Road Initiative will be used for military purposes, she said. "China is pouring resources in cyber and space warfare weapons, artificial intelligence, long-range missiles, and other advanced weapons systems," Bartholomew said during a press conference on the release of the report. "It is already outpacing the United States in some of these areas," she said. "Our report clearly documents China's increasing campaign to influence countries around the world through both implied and real diplomatic, economic, and military threats," Bartholomew said. The report said the arms buildup already has weakened the decades-long American military supremacy in the ground, air, maritime, and information domains within the second island chain—referring to China's strategy of projecting power further from its coasts through two island chains stretching from northeast Asia through southeast and as far east as Japan and Guam. "By 2035, if not before, China will likely be able to contest U.S. operations throughout the entire Indo-Pacific region," the report said. "As China continues to achieve its military modernization goals, the PLA will become increasingly capable of contesting all domains of warfare throughout the Indo-Pacific region and beyond." The Chinese strategy appears designed to contest the U.S. military by developing high-technology weapons, such as maneuvering missiles capable of targeting ships at sea, space weaponry, cyber warfare tools, and other advanced arms. The report said large-scale Chinese investment in such weapons threatens a key U.S. military advantage. "China's rapid development and fielding of advanced weapons systems would seriously erode historical U.S. advantages in networked, precision strike warfare during a potential Indo-Pacific conflict," the report said. Another key development was China's recent creation of the Strategic Support Force, a military service-level branch that combines intelligence, information, cyber, space, and electronic warfare groups in one place. "The new force signals Beijing’s intent to build a military capable of dominating these domains of warfare," the report said. The rapid buildup of advanced naval forces also is a key feature of the buildup, with deployment of large numbers of highly capable warships. The warships provide "naval expeditionary capabilities deployable around the globe as early as 2025, well ahead of the PLA's broader 2035 modernization goals," the report said. Also, China has rapidly fielded numerous types of medium- and long-range missiles fired from aircraft, ships, submarines, and ground launchers. The missiles "substantially improve China's capability to strike both fixed and moving targets out to the second island chain," the report said. "China’' ability to threaten U.S. air bases, aircraft carriers, and other surface ships presents serious strategic and operational challenges for the United States and its allies and partners throughout the Indo-Pacific," the report noted. 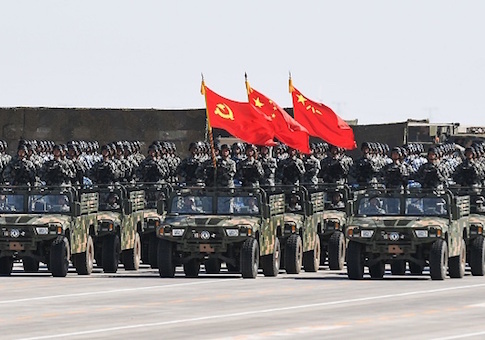 Another concern with the buildup is that China's military appears to be preparing for a conflict as a way to deal with the so-called "peace disease" and inability to conduct joint combat operations. "Much of Chinese leaders' concerns center on the PLA's lack of recent combat experience and the perceived inability of many operational commanders to carry out basic command functions such as leading and directing troops in combat," the report said. Xi has promoted a "strong military thought" ideology since 2017 that seeks to dispel the PLA's shortcomings in war preparedness and "combat mindset," the report said. The military buildup is driven by Xi's promotion of a so-called "China Dream" that is based on China achieving global supremacy by displacing the United States as the world's sole superpower. Through an economic program called the Belt and Road Initiative, China also is planning for future expeditionary warfare. Retaking Taiwan and solidifying its hold over disputed maritime zones in the South China Sea and East China Sea are key military objectives for the Chinese. The new commander of the Indo-Pacific Command, Adm. Philip Davidson, told Congress in April: "China is pursuing a long-term strategy to reduce U.S. access and influence in the [Indo-Pacific] region and become the clear regional hegemon, and Beijing has already made significant progress along this path. China is no longer a rising power but an arrived great power and peer competitor to the United States in the region." Roy Kamphausen, a China commission member, said that China's doctrine for using nuclear arms in a future conflict is unclear. "At the conventional level, the risk of escalation [during a regional conflict] though remains undiminished and trending higher," Kamphausen said. "So the risk remains high on the conventional side, even if the threat of crossing the nuclear threshold remains low," Kamphausen said.